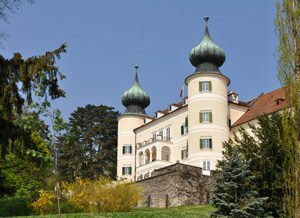 Artstetten Castle is an interesting palace which for centuries has been a family owned Austro-Hungarian Habsburg dynasty. Artstetten was actually the true home of Franz Ferdinand and his wife Sophie - the Duchess of Hoхenberg. Even today, the mansion remains privately owned to the family Hoхenberg but Artstetten is open for public visits. An interesting museum dedicated to the Archduke Franz Ferdinand which is a permanent exhibition of the name, For Heart and Crown can be viewed there. Artstetten Castle is located about 78 kilometers from the Rosenberg Castle. It is located a few kilometers from the village Klein-Pöchlarn, which lies right on the Danube. Artstetten dominates the river itself and it stands exactly on the border of Austria's Wachau region. The whole castle is surrounded by a magnificent park, which offers a moment of harmony of the beauty of the Austrian lands. The first castle on the site of today was erected there in the 13th century. During the following centuries, it underwent numerous transformations before it could be more significantly transformed in 1570 by Matthaeus Grundreching. In the years between 1691 and 1698 during the Baroque boom the construction and architecture of the castle underwent a significant restoration and expansion of the Maximilian Braun von Rotenhaus. Also at that time, an additional two wings of the palace were added. Castle Artstetten was completely burnt in both 1730 and 1760. Another natural phenomenon causing damage to the palace in 1791 was a severe storm that destroyed the roof. After this year, the distinctive dome of the castle and the front compartment with two bulbous domes were added. Used first as a residence and a summer villa of the Royal family, the castle became the permanent home of Franz Ferdinand and his wife Sophie. They inherited the mansion in 1896 by the father of Ferdinand - Karl Ludwig. Today Artstetten Castle and its seven towers flanked by the bulbous domes have been open for public visits since 1998. Every year they change and add various exhibitions so that the museum has more to offer to its visitors. A total of 30 rooms are included in the museum of which some of them are used as hotel guest rooms. Visitors of Artstetten Castle are now able to drink coffee or another drink in the pleasant cafe, which operates within the castle. Another option is to relax on the south terrace and enjoy the beautiful park with its beautiful old trees.